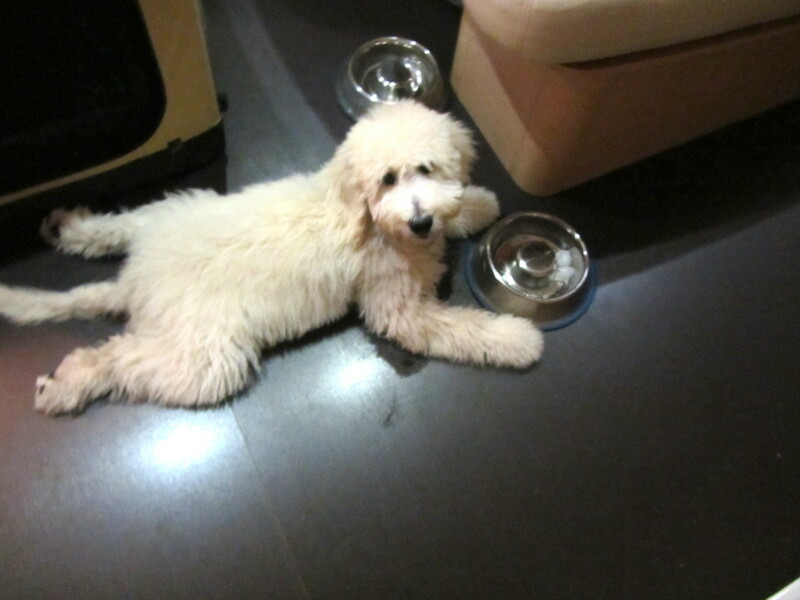 Sailor came to live on the boat at 12 weeks old. He has a long way to go before he is proficient at all of the boat jobs Daisy performed during her five years living on the boat. I will post these jobs on this page as he learns them. They are numbered from the bottom of the page up, so his newest job learned is at the top. Some of the jobs Sailor still needs to learn are: guarding the house, walking on the deck off leash and not falling in the water, staying on the boat alone, walking on beaches, riding in the dinghy, getting in and out of the dinghy, swimming from a beach, swimming from the boat, and keeping the helmsman’s feet warm while sailing. 7. 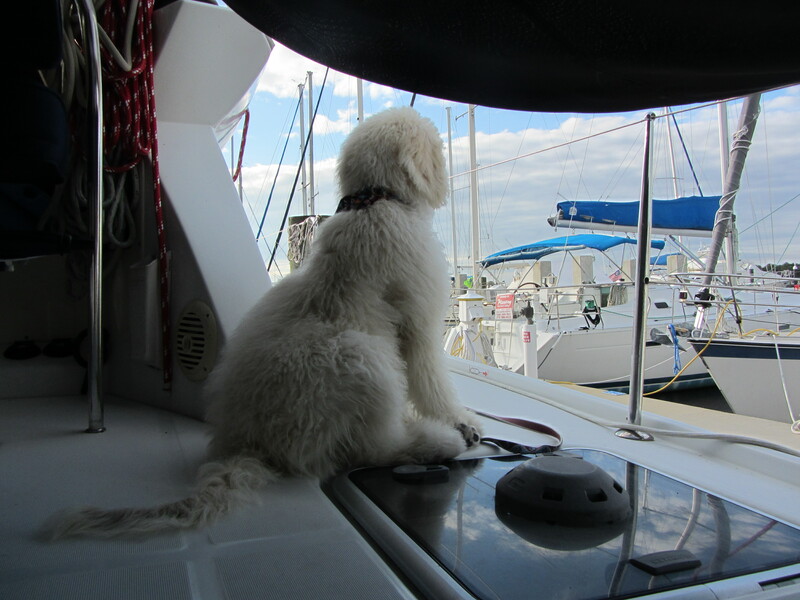 One of the biggest jobs a First Mate has is “Guarding the Boat.” Sailor is just learning to do this by sitting on the deck and watching what is going on in the marina. (Later, he’ll be working on guarding while the boat is anchored.) As a puppy, we can’t leave him alone on the deck, so we are nearby while he “watches.” Daisy never really understood the guarding concept. Wagging your tail at everyone who comes near and trying to get them to pet you is not the way to discourage unwanted visitors. Hopefully, Sailor will be a little more protective and maybe even bark occasionally. 5. 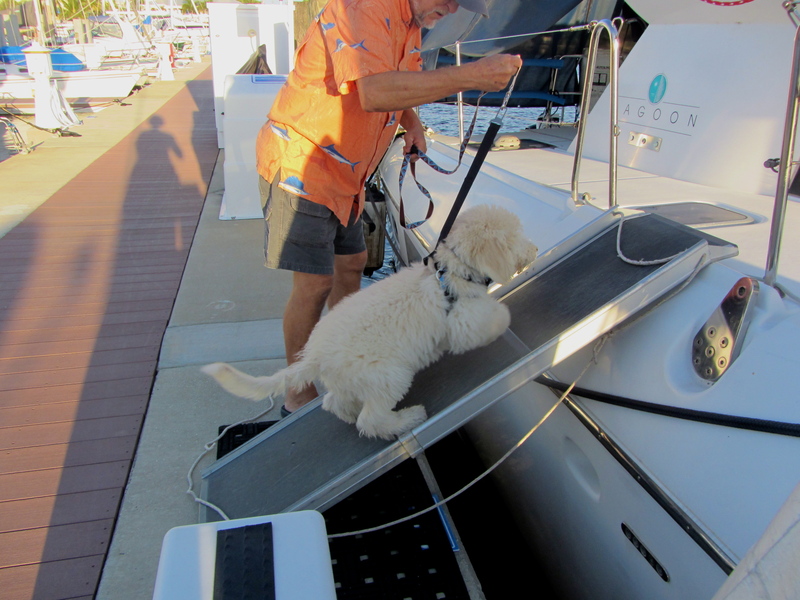 The First Mate cannot use the steps in the side of the hull to climb aboard, so he has to walk up a ramp. When there is a very high tide, sometimes the ramp is quite steep. As the First Mate gets heavier, he must be responsible for getting himself aboard. 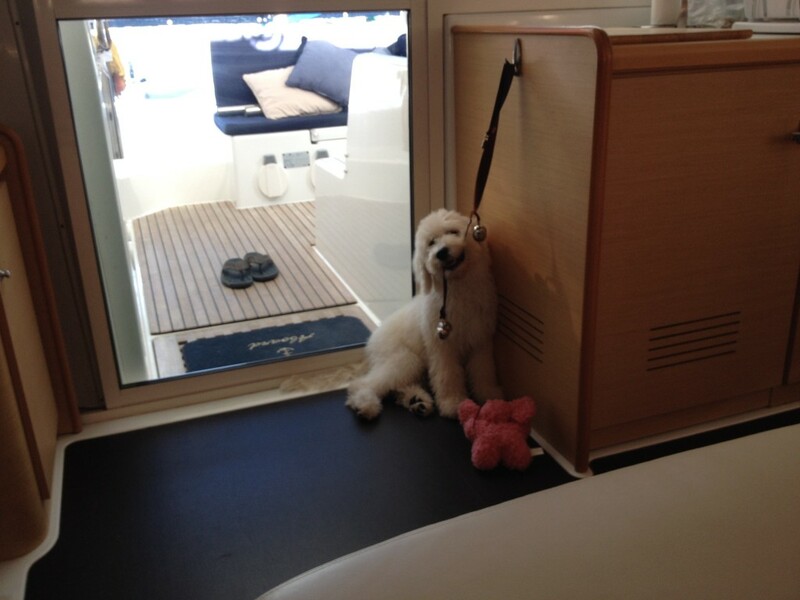 Sailor mastered this skill within the first few days he lived on the boat. In addition, he sits and waits patiently for the crew to position his ramp from the dock to the deck and then he quickly runs down or up it. 3. Sitting on a bench and looking cute is a job a First Mate must master. 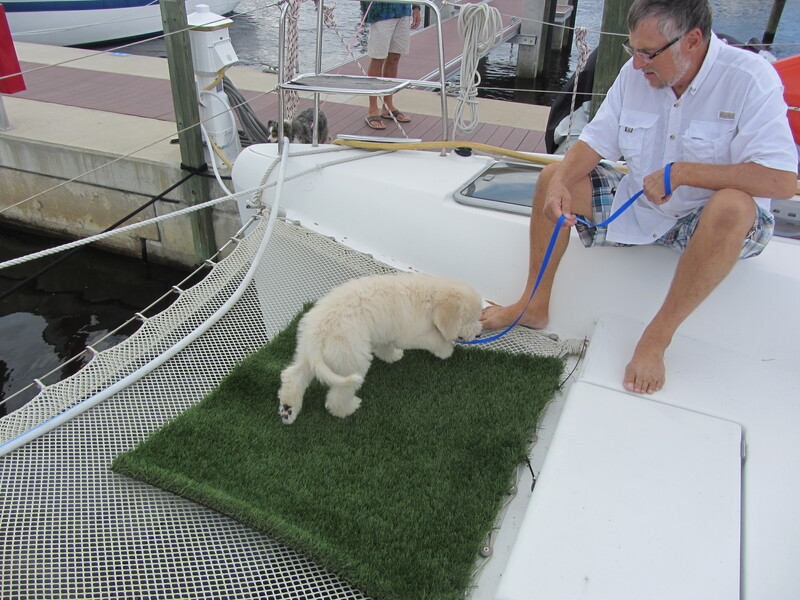 An added benefit is the admiring attention the First Mate gets from people passing by. 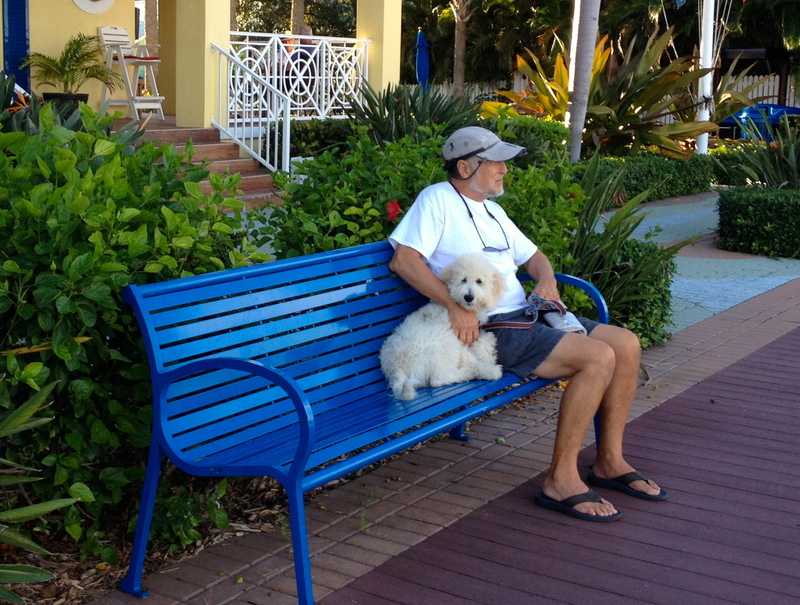 In addition, he has to like music because each night there is a band at Sailor’s Return Restaurant, next to the marina, Sailor needs to sit quietly on a bench and listen. So far, Sailor is doing well on his bench jobs. 2. A First Mate must be willing to occasionally use a trampoline “head” if the crew is unable to get ashore. Sailor learned this important job on his first day aboard Seas the Day. The crew will appreciate this when we have to leave an anchorage at first light and we can put the dinghy up on the davits the night before, without having to take him ashore before we leave. 1. 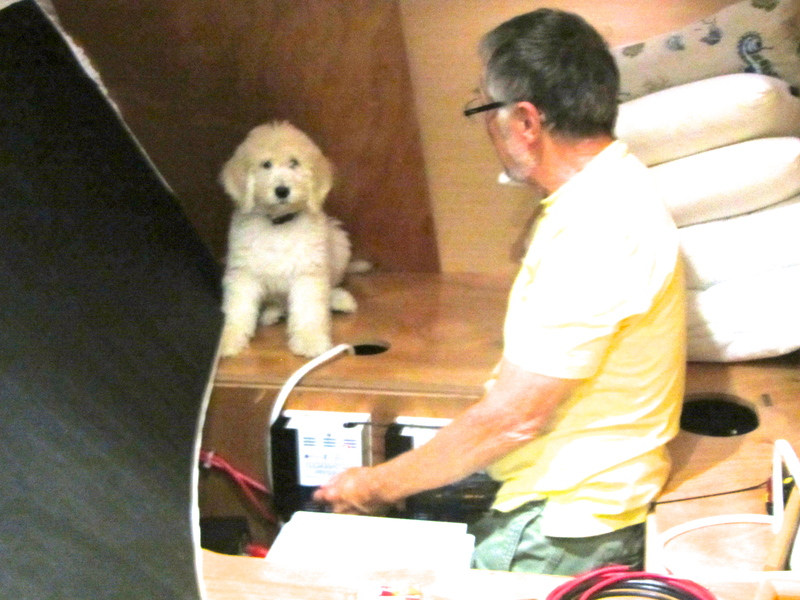 A First Mate needs to assist the Captain while he is making boat repairs. In particular, he should be able to fetch tools that are dropped and not chew on them. He also must keep the Captain company and make him smile if the repair is not going well. Sailor has accomplished the second part of this job, but is still working on the fetching and not chewing tools part.